Award winning country singer Kenny Chesney will head off on the Songs for the Saints Tour beginning in April of 2019. His first tour date will be in Louisville, KY at the KFC Yum! Center and he will be touring all the way through to May 24, 2019 where he will end his shows at the Tuscaloosa Amphitheater in Tuscaloosa Alabama, with only twenty tour dates along the way. This is the first concert tour that Kenny has done in quite some time that isn't going to be for the 100's of thousands of fans, but more for the intimate audience. The arenas that Kenny plans to play in are going to be smaller gigs, he wants to feel closer to the fans than he has in the past, and his goal for this tour is to make the music sound more soulful, performing sets where he can speak to his audience and they can communicate back with him. Because Kenny has decided to take on these smaller arenas along tour schedule in 2019, he's pulled a rising star with him, but one that you may never have heard of Caroline Jones. Caroline Jones is twenty-eight years old, and this Songs for the Saints Tour 2019 will be her first concert tour. Her debut album "Bare Feet" showcases her many instrumental talents, such as guitar, mandolin and piano. Caroline's sound is more folk than Kenny's but the two will sound incredible together, if you enjoy a good, laid back, country vibe, you will definitely enjoy Caroline. She's taking the unconventional road and not headlining on her first tour, which is something that could be a hit or miss for her career, but it seems that with Kenny Chesney backing her up, she is on the right path. Another country star is touring with Kenny Chesney and Caroline, someone that has been in the music industry for a long time, David Lee Murphy. Kenny Chesney with David Lee Murphy. You may know him from the song "Dust on the Bottle", which was a hit in the early 90's. Even if you haven't been keeping up with Murphy, just know he hasn't been taking any time off from making music, he's written songs for other country artists like Jason Aldean and Luke Bryan. He's also got a new album that just came out, called "No Zip Code". Not only that, but Murphy played with Kenny on past concert tours, and they had a blast together, becoming lifelong friends. Watching the two on stage will certainly be history making. It will be interesting to see if all three play together along 2019 Songs for the Saints Tour tour dates, the mix of old soul country and new country stands to be a beautiful thing. This is the type of concert tour that most country fans dream about. 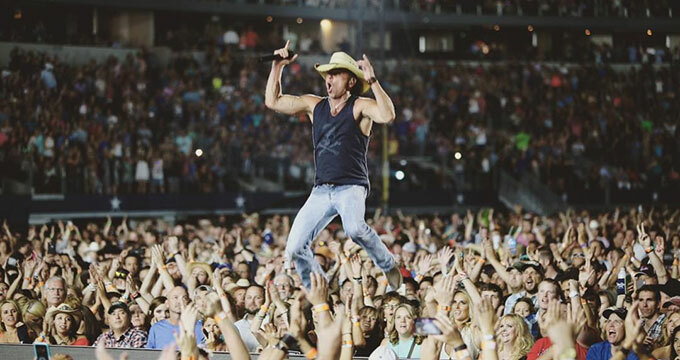 Not only will you get to see Kenny Chesney live and boisterous as ever, as well as folky Caroline, and the mellow sounds of David Lee Murphy, you'll get to watch them up perform close and personal each tour date. One of the arenas that Kenny and friends will be playing only houses 10,000 people, so hopefully this means that you'll get a clear view of what's going on up there on the stage, and everyone will be included in the fun. This 2019 tour sounds like it will be one to remember for years to come, so look at tour schedule again, choose the date and get your tickets today!